Mardin has long been a favorite destination for local film and TV series producers and has now started to attract Hollywood producers as well. With its architectural, cultural and social texture and a history dating back some 7,000 years, Mardin has lured many local directors for movies, documentaries, TV series and clips. After serving as the setting for “Ay Lav Yu,” a Turkish-American production, this historic city is preparing to serve as the setting for more Hollywood productions. 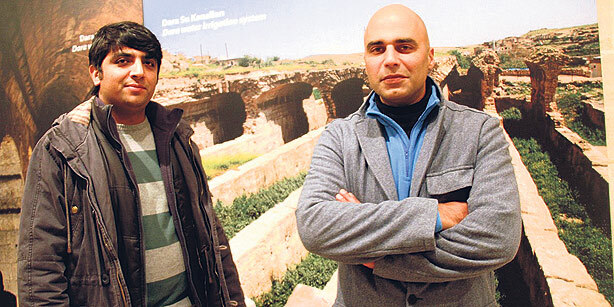 American producer Manu Gargi and Turkish producer İlhan Kızılkaya recently paid a visit to Mardin, where they toured historic sites accompanied by Mardin Governor Hasan Duruer. During the shooting of “Ghost Rider: Spirit of Vengeance” in Cappadocia and Pamukkale, the producers were impressed with Turkey’s historic and natural assets, and they chose Mardin as a setting for their new action film. After seeing historic and touristic sites, museums and ruins in Mardin, American producer Gargi said he was deeply impressed with the city’s magical atmosphere. He noted that when he and Oscar-winning actor Nicholas Cage met Turkish Prime Minister Recep Tayyip Erdoğan, they heard a lot about Mardin and were curious to see the city. “We have heard about it before. But I had not thought that it was this impressive. We wanted to see and shoot some scenes. We have an action project. It’s not about Mardin, but we are planning to shoot it in Mardin. We’ll shoot several parts of the film in Mardin. Of course, there are great actors we are planning to hire for this action film. Really great actors, but I cannot name them now. I can only say that great actors will play [in it],” he said. Gargi also explained that although he really wanted to see Mardin, Cage had to return to Romania to complete the film. “Mardin’s stone architecture is unique. Mardin looks like an outdoor museum. The architectural texture is for us filmmakers a film platform we cannot find anywhere else. Mardin may become a precious film platform for Hollywood,” he said. Governor Duruer stressed that if Mardin is chosen as a setting by Hollywood producers, it will make great contributions to the promotion of Mardin. The Mardin governor noted that Cage had recently met Prime Minister Erdoğan and Culture and Tourism Minister Ertuğrul Günay. “Our prime minister advised him to visit Mardin. They say they are particularly impressed by Mardin. They are planning to make a movie here. They said shooting will take about three months with about a 300-people staff. Approximately 300 people will be employed in this process. We hope this film also features key actors such as Nicolas Cage. The US has finally discovered Mardin’s enchanting atmosphere. If Turkey is to become a filming location, I think its best spot is Mardin. If we eliminate visual pollution, everywhere will become a natural plateau,” he said. Duruer added that they are ready to lend support to local and foreign producers who intend to make movies in Mardin. Mardin’s emergence as a favorite destination for local and Hollywood filmmakers will contribute greatly to its promotion. Mardin, a city visited by more than 1 million local and foreign tourists in 2010, became visible to local producers particularly after “Salkım Hanım’ın Taneleri” (Mrs. Salkım’s Diamonds), starring Hülya Avşar, and “Deli Yürek” (Wild Heart), starring Kenan İmirzalıoğlu, were shot. Later, “Berivan,” starring Sibel Can, “Asmalı Konak” (Vine Mansion), starring Özcan Deniz, and “Aşka Sürgün” (Exiled to Love), starring Mahsun Kırmızıgül, added further momentum to this process. As a city that has attracted the attention of British Prince Charles, Mardin is now on the rise as a popular location for filming. Many foreign filmmakers are turning their attention to Mardin. The 2009 film “Ay Lav Yu,” written, directed by and starring Sermiyan Midyat, features famed Hollywood actors and actresses Steve Guttenberg, Mariel Hemingway, Katie Gill and Josh Folan. The premiere of the film was held in Mardin and garnered much interest. Here are a list of several films and TV series that take place in Mardin: “Berivan,” starring Sibel Can; “Aşka Sürgün,” starring Mahsun Kırmızıgül; “Missing You So Much,” starring Zuhal Olcay; “Azap Yolu” (Road to Torment), starring Kadir İnanır; “Ağa” (Agha), starring Levent Kırca; “Küçük Ağa” (The Little Agha), starring Serdar Gökhan; “Sıla” (Reunion), starring Mehmet Ali Alakurt and Cansu Dere; “Tutsak” (Prisoner), starring Hande Ataizi; and “Bir Bulut Olsam” (If I Were A Cloud), starring Melise Sözen.